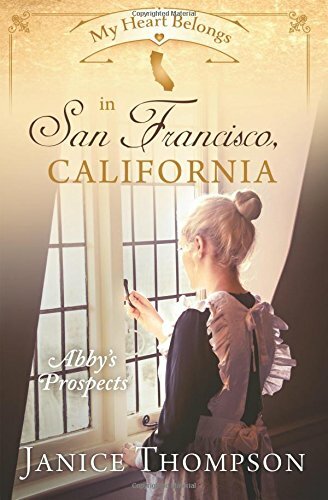 Abby is traveling with her butler to Oregon to bring her mother back home to Philadelphia. However, there is no current route there due to the road being washed out so Abby and Neville, the butler, end up in a boisterous and rowdy town. Within moments of their arrival, shots are fired in the air as men gallop down the street celebrating. With the cost of living being so high, Abby must decide to abandon her quest for her mother, request funds from her father, or learn how to work menial tasks to earn money. Work like that is new to Abby as she has grown up as a lady of means and with servants at her beck and call. Within a few days, Abby isn’t sure she will ever move without pain ever again. Cookie and Sam are workers at a food and inn establishment that Sam’s father owns. They have a history and have known each other for a very long time. Sam’s father is mulling over the option of selling the food and inn establishment, thinking Sam no longer wants to run the business. As one reads the story, watch for changes in the hearts of the characters. Cookie is one special lady who can recall scripture for situations along with where it can be found in the Bible. The story is filled with climax, romance, scripture, and slowly builds the tension in the plot. I cannot wait to see what the next book the author or the publisher of this series brings to the market. Each book in the series, though written by different authors and stand-alone books, audiences can easily read in a short amount of time and enjoy. Consider sharing your copy with friends and family as well as asking your local library to purchase the series for any age of adult readers.